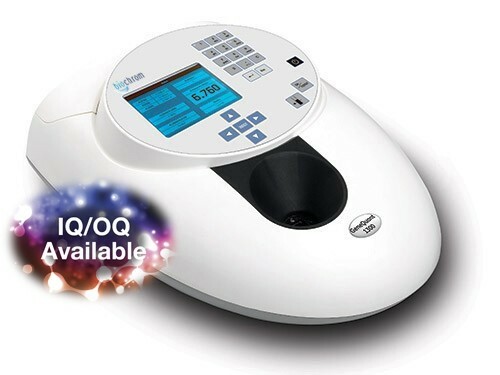 GeneQuant 1300 is designed to measure the concentration and purity of nucleic acid and protein samples and the density of bacterial cell cultures at a broad range of sample volumes. It can be used with a variety of cuvettes for sample volumes 3 µl to 2 ml. Large, easy-to-read graphical display. • Wavelength scanning of nucleic acid samples for purity checks. • Optics with no moving parts for high-energy throughput combined with a Xenon lamp for a long lifetime. • Storage for 90 user-defined methods with (optional) password protection. • Predefined methods for nucleic acid purification, protein assays, CyDye, and cell culture density measurements. • Wireless bluetooth connectivity (optional).